Hey there. 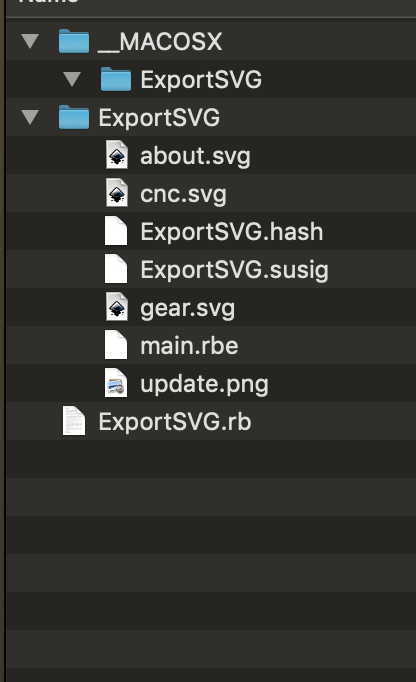 I downloaded the ExportSVG.ZIP for mac and it would not extract with the MacOS default extractor. Kept showing error 22. So I downloaded another zip extractor and it worked. However, when I try to install the plugin all the files show greyed out for me. I am using Mac Mojave and Sketchup 17 Make. Sounds like you have a very old version, we haven’t shipped a ZIP file in a while. We’re doing RBZ’s for Mac and EXE installers for PC. 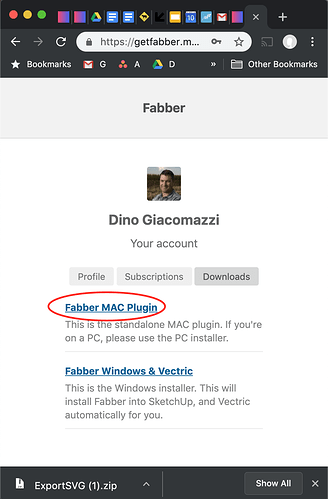 I should have mentioned that I paid for the new version and downloaded the zip file by clicking the Mac download from the link in the email I received. Once downloaded, the default Mac unzip app would read Error 22. I was able to extract the files using an alternate app. See the attachment for list of files in the zip package. I attempted to open the .rb and .rbe files in the plugin installer in Sketchup but they are greyed out. Not sure what I am doing wrong and would appreciate any assistance.